West Kingdom in cooperation with Shadow Warlords demolished Gruul’s Lair. We totally one-shotted that raid instance. So we decided to go peek in at The Eye. Joe (the head of Shadow Warlords) and fiancee (the head of West Kingdom) had gotten the impression that just the trash was going to smash us flat at our current gear level. They were wrong. We had some bumpy parts where we were learning the fights.. but I’m pretty sure that we’ll do much better next time. We made three attempts on Void Reaver. At best we got him to 6% on our third attempt. Finally we had to call it because the respawn was catching up to us.. and the warlock had run out of soul shards for summoning people. I’m hopeful that the next time we attempt it I’ll be able to report a guild first. My favorite part was where we had a flock of mage-made sheep. It made me laugh. 6% is really close! You guys’ll get him next time. Your post just made me realize that it’s been a while since I’ve seen sheep sheeps in my raids. 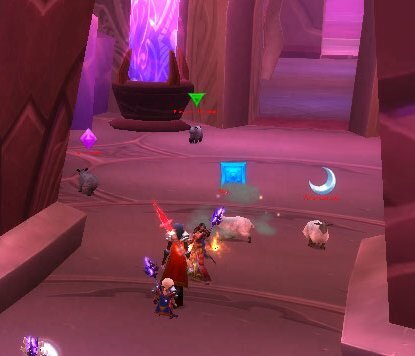 It seems like all our raiding mages either have the turtle or the pig. Yar I am sure you will get it. Violet Signet trinkets are useful! Also while you are learning to run away from orbs having everyone decked out in one or two pieces of arcane resist or high stam (if your ranged are sitting around 8k hps then your healers should be able to save them after a hit) gear allows you to “brute force” the encounter. Also if your healers are well geared they can heal the melee through the pounds. Kings and Salv combo is wonderful for this one. The only thing that is tricky is having enough total dps to get him down before the Enrage. If you guys are using the BigWigs sort of auto chat bubble shoutouts for orb watch then I would recommend asking people to give it a count of 2 before running away from their orb. It gives people near them more of a clear idea where the orb is hitting and is still plenty of time to dash away at a full run. I have gotten off a full Holy Light cast and then ran away and still made it out of the orb radius!